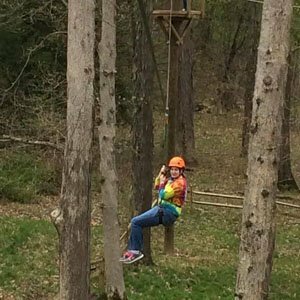 What is the Ohiopyle Zip-line Adventure Park? We are often asked, “How does your zip-line adventure park work?” Or we get the question, “What exactly is a zip-line adventure park?” Well, rest easy because here are all the answers! By adding the term “Adventure Park” to zip-line it should notify you that it’s NOT just a zip-line. There is going to be some more cool stuff involved! You will not go screaming down a 2,000 foot zip-line at 50+ mph like some other zip-lines in our area. The Ohiopyle Zip-line Adventure Park includes challenge obstacles similar to something you might find on a ropes course. The park is closed-circuit meaning once you are clipped into the Safe Roller system, you can continue through the entire course without having to un-clip your harness tether from the guide wire after each obstacle. So, the way the Ohiopyle Zip-line Adventure Park works is you reserve an hour time block. We ask that you check in 15-30 minutes before your reservation so there is time to fill out your paperwork and get everyone in your party into harnesses and helmets before your hour starts. You can then climb onto the course and spend the ENTIRE hour playing in the trees! Don’t worry, advance reservations are NOT necessary! We take walk-ins as long as there is have space available. What will I find at the Ohiopyle Zip-line Adventure Park? There are two levels of difficulty at the Adventure Park. The Explorer level has three challenge obstacles and 90 feet of zip-line. The challenge obstacles on the Explorer have fun names like Taco Net and Plank Bridge. And the Adventure level has six challenge obstacles and 200 feet of zip-line. The Adventure level obstacles have cool names like Silver Surfer and Burma Bridge. Both levels require that you climb an Entry Net to access the starting platform. The Entry Net for the Explorer level is approximately 12 feet tall and for the Adventure level, the net is approximately 30 feet tall. The Explorer level was added with younger children in mind (minimum age of 4, minimum weight of 40 pounds). Most zip-lines don’t allow younger children to participate, and we think that’s just not fair! This doesn’t mean that the Explorer level isn’t fun for adults, too. It’s still exciting for all those “Big Kids” out there. We do require that children under 48 inches tall be accompanied by an adult. The minimum requirements for the Adventure level are 10 years old and 70 pounds. And there is a maximum weight limit of 250 pounds for both levels. So you might be thinking, “I just don’t understand how this Adventure Park works.” Check out our Safety video to see how to zip-line properly at the Ohiopyle Zip-line Adventure Park. 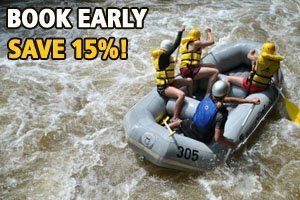 All the other fun things to see and do in Ohiopyle, like whitewater rafting on the Lower Yough or Middle Yough guided tours. Check out some of our packages for rafting and zip-lining. We also offer fun field trip packages that include zip-lining, biking, hiking, and gem mining! And there are Team Building packages that include zip-lining or whitewater rafting for a variety of groups from corporate retreats to fun family outings.